Well fine, MAKE ME WASTE MY TIME! Do you have something better to do? Besides fap to MotH, no! You know, what the problem here is? Remove the space between the - and the fsSL. @cold_arctus do you know who to talk to about getting changes in the install guide? thanks, it looks like it worked. as for the next step, "brew install cabextract", what does it mean? I'm not a Mac user, but this should help explain it. thanks! that helps. now on another step, it says to cd to the location of winetricks, where can i find winetricks? I don't recall getting or installing winetricks? 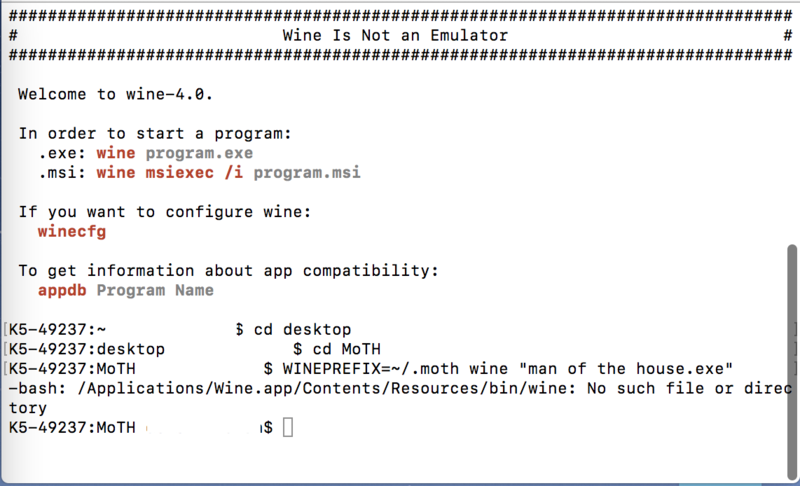 WINEPREFIX=~/.moth wine "man of the house.exe"
Maybe that's a different message for the same error, changed in 4.x? Try an absolute path. Edtorious, save that page as a file called "winetricks". I'm trying to locate it now in under the Mac installation guide, but I'm not seeing it (the link that is - or the incorrect link) unless I'm overlooking the obvious? I added a link to it on number 5 in the guide. Minor change in revision (see second image). No, thank you for the updated info. That probably would have confused some users. Thanks for the help @goobdoob and @Sycho it works now but the only thing I can't figure out is the Mac command script to launch MotH under wine step. I downloaded the script and unzipped it to my desktop. This is the part I do not understand (You will need to edit it with the location of Wine Staging, or use Wine Staging 3.19 and put it in /Applications (the default installation location)). Can someone clarify this for me? Thanks. If that's not where your Wine app is, change that line to be the path and filename of your Wine app. The script should sit in the MotH folder, right next to the .exe. You get this message, because you do not have a (new) Wineprefix named ".moth" in your $home directory. We tried 3.19 staging and 4.0 as well. He gets the same messages even with the default config. Do you have a terminal command which can delete wine with all his folders and files on a Mac? You can either save it as file named winetricks or install it via Homebrew. Using Homebrew (brew install winetricks) a file named winetricks will be saved in usr/local (or was it usr/bin - really don't know where it is on a Mac!). There's this secret command to delete stuff called "rm" . Delete the app and the wine config directory separately; nothing like the Linux package management stuff. There are installers/uninstallers, but they're not used for Wine. OK, Wine can use an installer, but short answer is no. Using an absolute path for WINEPREFIX worked for me. I was able to launch MotH; it created the new prefix in ~/.moth. Try $HOME/.moth instead of ~/.moth. Of course, it didn't have corefonts or the video stuff since I didn't install those, but MotH ran. I haven't used brew to install winetricks, so I don't know what that does. Ok, now I see were the mistake was in the old installation guide. You used the command (above) to install cabextract. 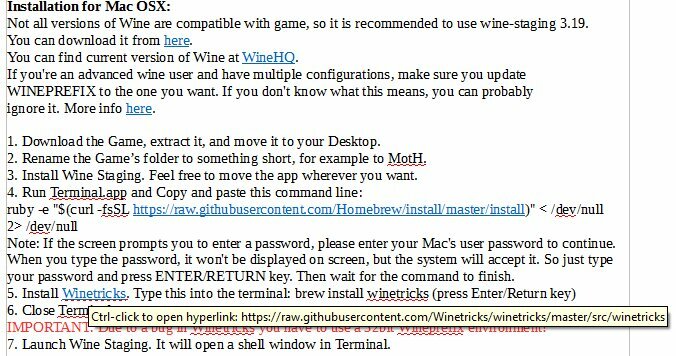 I'm not saying I haven't used brew; I haven't used it to install winetricks! You're welcome. Whenever you're ready, let me know. It finally working and by accident. Yesterday I watched hockey game and attach my laptop to TV with HDMI cable. At the break I check whats new on F95 and saw Moth so I decided to give it the last chance, I run it as an admin, hockey game went silent and the game start. After hockey match I removed the cable and try the game and get same errors when I last time asking help. Attach HDMI again and the game runs perfectly, during the game I can remove the cable and it works fine. Now I'm thinkig why I can't start game without the cable. Attach HDMI again and the game runs perfectly, during the game I can remove the cable and it works fine. Now I'm thinkig why I can't start game without the cable. This sounds like a configuration or driver problem to me. Recently we got a few people with Gaming Laptops and AMD Graphics Card, who had problems to play the game. Pls. share more information about your System etc.